This post was first published on kevinbuist.com. Each year I do a list post about the best art I saw over the past twelve months. I don’t claim that these are the best exhibitions of 2017, because I don’t see nearly enough to make that claim. But I still think it’s worth keeping a log of the exhibitions and artworks that moved me this year. These are listed in the order in which I saw them. Most are newly created, but some are… definitely not. I always see good work at ArtPrize, but I never include it on these lists because that would seem a little too insular. I visited Crystal Bridges in Bentonville, Arkansas for the first time this year. When I was there they had a temporary exhibition called Border Cantos. It was a collaboration between photographer Richard Misrach and sculptor/sound artist Guillermo Galindo. 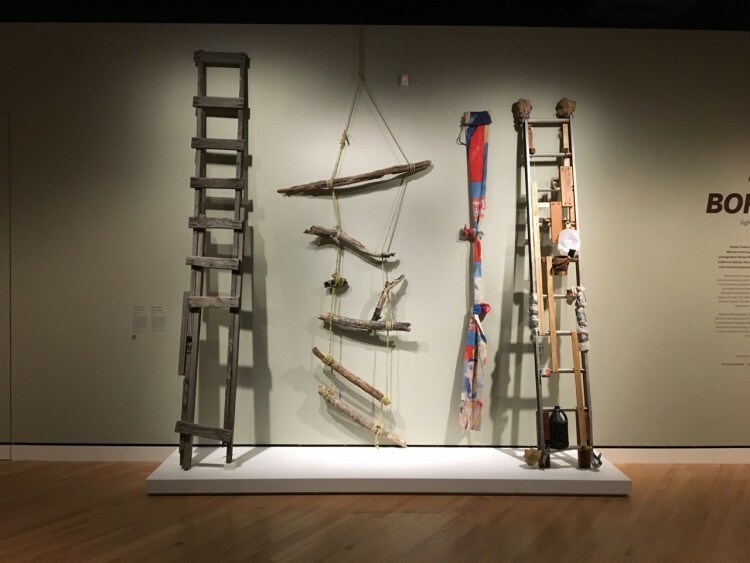 Misrach provided stunning large-scale photos of the US-Mexico border, while Galindo exhibited sculptures that doubled as musical instruments made from detritus collected from the borderlands. The images and objects were creative, playful, sorrowful, and devastating all at once, over and over again (it was a big show). The curation and didactics were also wonderful. Here in this deep red state was a show that unapologetically humanized the experience of the people who cross this border for a chance at a better life. It’s a landscape packed with stories of struggle for freedom and opportunity. What could be more American than that? I visited Documenta for the second time this year. 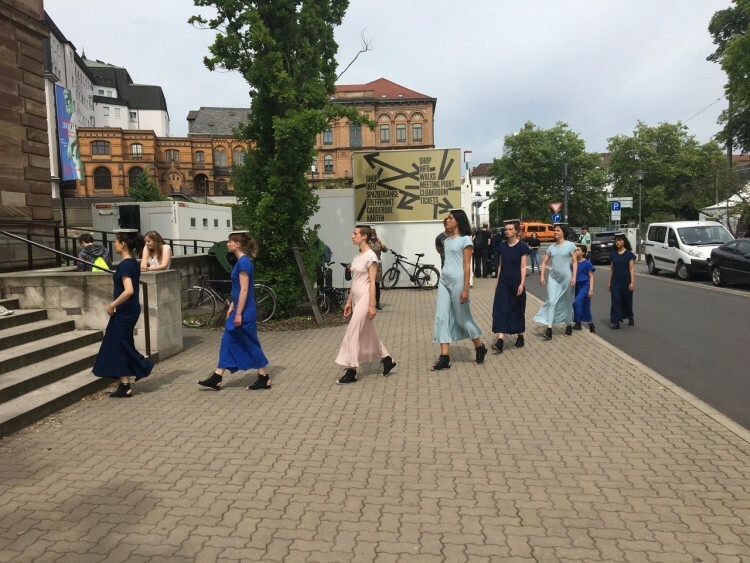 Documenta is the massively influential exhibition that takes place in Kassel, Germany once every five years. Except this year it was split between Kassel and Athens (I didn’t see the Athens part). Overall the Kassel portion was a little underwhelming, but there were some really powerful moments. One of my favorite works was a multifaceted project by Irena Haiduk called SER (Seductive Exacting Realism). It consisted of installation, performance, crayon rubbing, sitting in a dark room listening to recorded voices, and a merchandise line of shoes and dresses. I wrote about it on my blog earlier this year, in a post called Art is a Waiting Room. The piece seemed to sum up a certain uneasiness in a way very few artworks do at the moment. Another part of Documenta 14 that really stuck with me was an installation of photographs, paintings, drawings, and artifacts from Lorenza Böttner. Böttner was a local trans and disabled artist who was active in the 80’s and 90’s until eventually losing her life to AIDS in 1994. 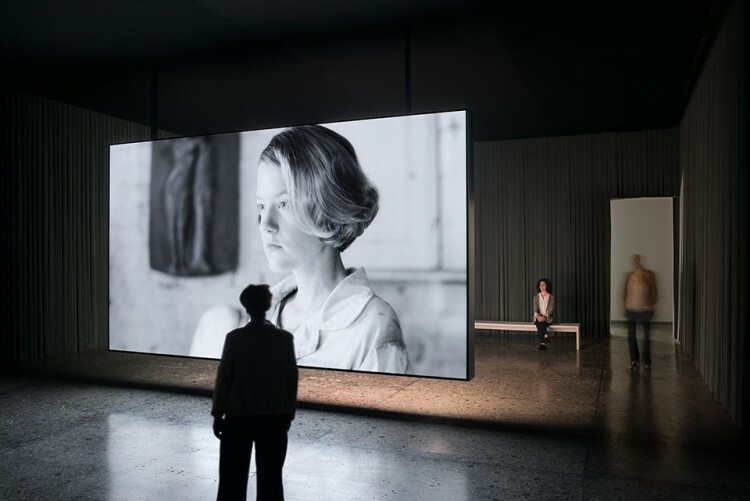 It was a smart choice to include a dense collection of images and text–only a small portion of which is shown above–as it gave viewers the chance to grasp Böttner’s important biography. She was born male, lost both her arms in an electrocution accident as a child, then went on to forge a career as an artist and a woman who challenged one convention after another. The work was funny and harrowing and felt way ahead of its time. After Documenta I went on to the Venice Biennale. The main show was alright, but nothing stood out as a real show-stopper. There were some wonderful national pavilions, however, which are organized independently of the main show. 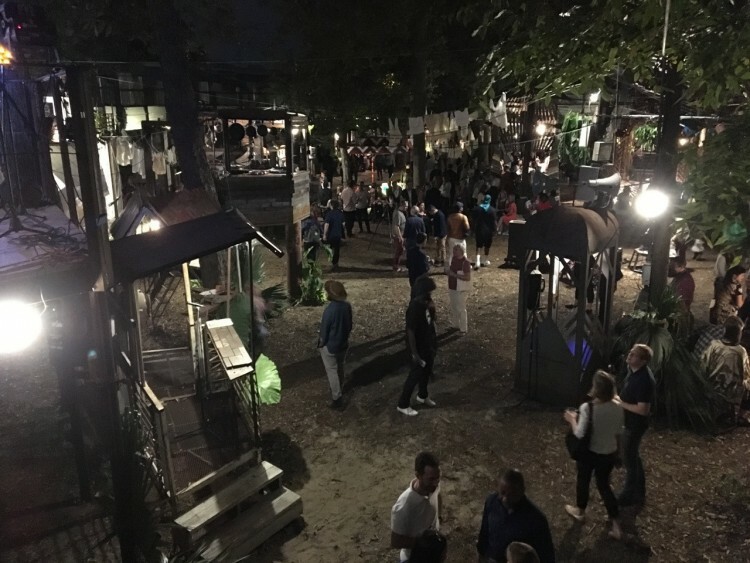 My favorite was the Swiss Pavilion, which had sculptures by Carol Bove and a two-channel video installation by Teresa Hubbard and Alexander Birchler titled Flora. Two videos were projected on the opposite sides of a single screen, which shared one audio track. One video takes the form of a documentary, the other is a reenactment. Together they tell the story of Flora Mayo, and relatively unknown American artist who studied in Paris in the 1920’s, when she was briefly Alberto Giacometti’s lover. The piece takes what was an art historical bit part and reveals a complex and tragic story of a remarkable woman. There’s an interview with Flora’s son, who is still alive, that brought me to tears. It occurred to me that art history must be riddled with other “Floras,” mostly under-appreciated and forgotten women, erased from the dominant narratives of the male artist geniuses. In Venice I visited the Palazzo Ducale, or Doge’s Palace, a massive 14th century gothic complex in central Venice. For centuries it served at the residence of the Doge, the ruler of the Republic of Venice, before being turned into a museum in 1923. The tour is very long, passing through many intricately ornamented chambers, medieval armories, and dungeons. Eventually I reached the Chamber of the Great Council, an enormous room containing what they claim is the world’s largest painting on canvas, Tintoretto’s Il Paradiso. 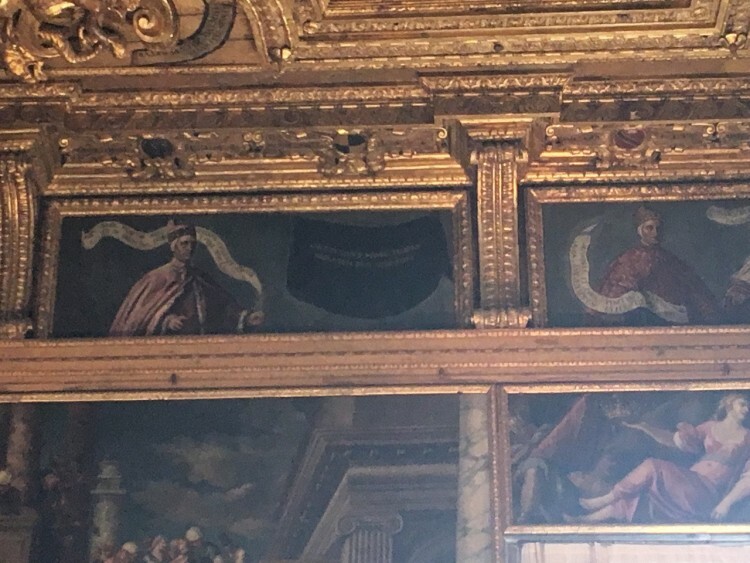 Every other surface is covered by paintings as well, including a row of 76 portraits near the ceiling depicting each Doge in the order of their rule, along with a scroll saying what they accomplished. Near one corner a portrait is missing, and in it’s place is a painting of a black cloth with the latin inscription, “Hic est locus Marini Faletro decapitati pro criminibus,” or, “This is the space reserved for Marino Faliero, beheaded for his crimes.” Faliero was the Doge for only a few months from 1354-55, when he attempted a coup d’etat. The coup failed and he was beheaded. A label on the wall below explains that Faliero was considered a traitor to the Republic, and was condemned not only to death but also “damnatio memoriae, the total eradication of his memory and name.” There’s a certain irony to this, of course, because I only learned his name by seeing his lack of a portrait, which contains an inscription that includes his name. I won’t go too far into it here in this list post, but being in Europe in the midst of the slow-motion train wreck of the Trump administration afforded me a welcome dose of historic and geographic perspective. Sometimes great societies have terrible leaders. Empires survive, but the stains linger as well. How will we remember the things we want so badly to forget? 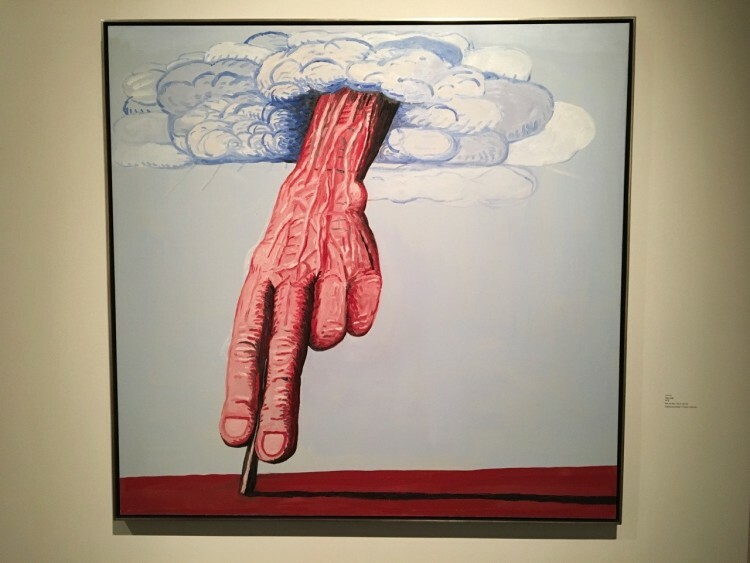 Another show I saw in Venice that was not part of the Biennale was this stunning Guston show that traced his relationship with the work of five poets: D. H. Lawrence, W. B. Yeats, Wallace Stevens, Eugenio Montale and T. S. Eliot. I already liked Guston, but this show revealed remarkable things about the work I hadn’t seen before. The wall text, which included plenty of poetry, was the best I’ve seen. A few weeks ago I went to New York for a screening of the ArtPrize documentary, More Art Upstairs. 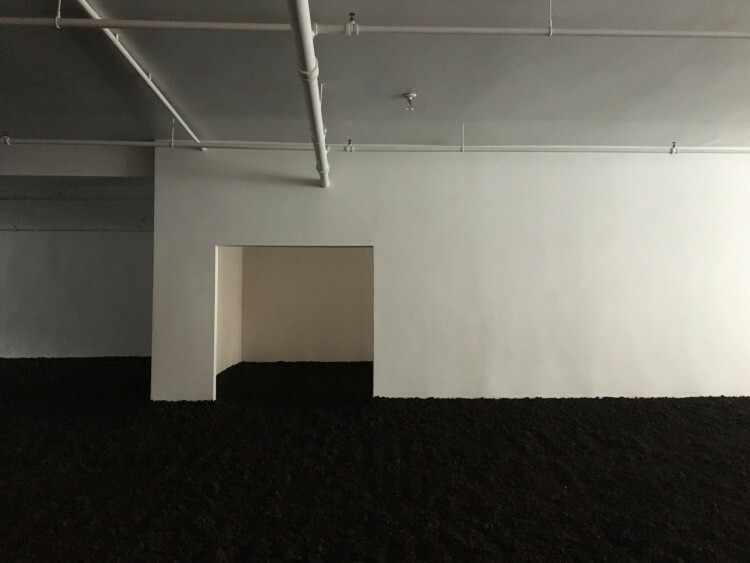 I figured out that my hotel was a few blocks from De Maria’s New York Earth Room, which I’d never seen before. The work is relatively large apartment on the second floor of a building in SoHo that’s filled with about two feet of dirt. It’s maintained and staffed by the Dia Art Foundation, and they keep regular open hours. You have to buzz in to an inconspicuous doorway, then follow signs leading up a narrow flight of stairs. The apartment contains a small lobby with the attendant’s desk, and the rest is filled with dirt. You can’t walk on the dirt, and you’re not even supposed to photograph it. The same dirt has been sitting there since 1977. There’s something very comforting about know that that mass will always just sit there, impenetrable, oblivious to everything around it. My favorite feature is that the dirt extends into another room. You can see some of the room through an open doorway, but most of the dirt in there will never be visible to anyone. It just exists. In November I went to New Orleans for the opening of the Prospect.4 triennial. The entire show was excellent, and a lot of the best people I know in the art world were there. I’m highlighting two works on this list that really stood out. The first is Reflections on Time by Pedro Lasch. Prospect.4 is staged in venues across the city, including museums and less traditional spaces. This project was installed in an antique shop in the French Quarter, and Lasch took that opportunity to collaborate with the shop and integrate their collection into the work. A small gallery is lined with black mirrors, dark reflective rectangles of glass, each with a faint image printed on them. 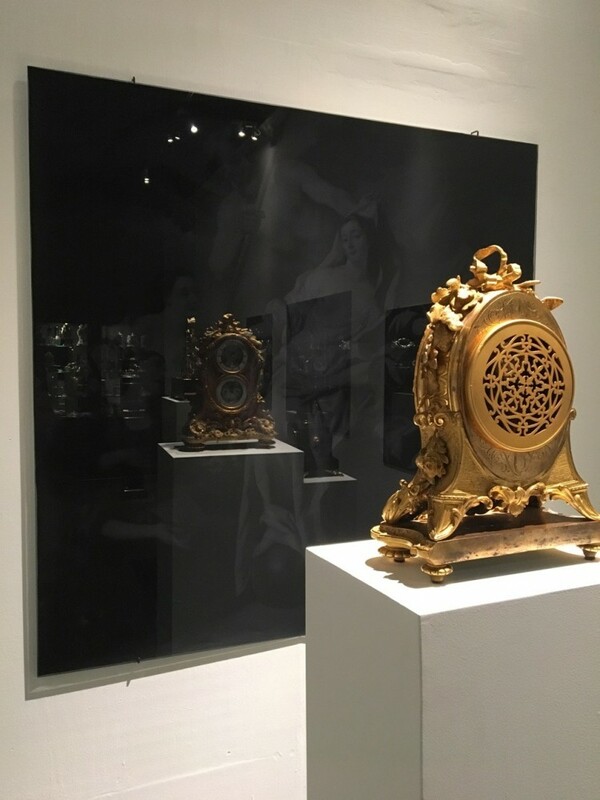 In front of each glass is a pedestal containing an ornate antique clock, the faces of which can best be seen as a reflection in reverse. The images printed in the mirrors are also borrowed, from art history and popular culture, each one relating to the theme of time in a different way. The gallery containing the installation was at the very back of the store, so that in order to see it I had to wander through a labyrinth of ornate artifacts. Once I finally made it to the artwork, I was ready to think about time. For Prospect.4, Tsabar staged a performance in her ongoing Composition series. 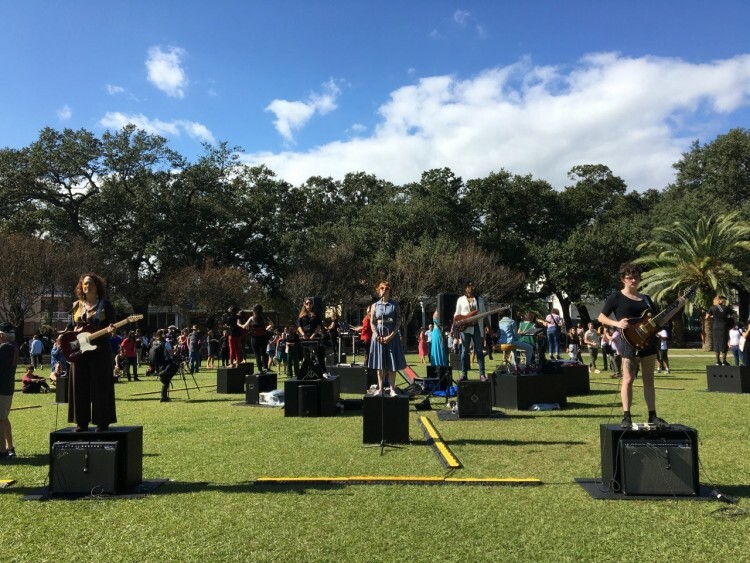 About twenty local musicians, all women, stood atop amps or small platforms in a triangular arrangement in a city park. A drone began emanating from the amps, as the crowd moved around the stoic musicians, they began playing songs commissioned by Tsabar. There were three groups and three songs. They went one at a time around the circle, then they all played all three songs at once, layering and looping the sounds together. Each audience member heard their own audio mix depending on where they stood. At first, the crowd only moved around the periphery, positioning itself in front of whichever musicians were playing. But shortly after they all started playing at once, a group of five or six junior-high aged girls walked right into the array of amps and platforms. It was like membrane suddenly ruptured, and the whole crowd suddenly flooded in. The emotional resonance of certain keys of music is something I don’t fully understand, but there was some magical version of it happening there. I cried. The artist party for Prospect.4 was held at an incredible venue that doubles as an artwork. The Music Box Village is a collection of bespoke buildings, forts, gazebos and other structures that are all functional musical instruments. It’s a fusion of sculpture, architecture, and endlessly creative musical instrument design. The installation is build by a local nonprofit called New Orleans Airlift, and was not a part of Prospect.4 (except as an event venue). Toward the end of the party the building/instruments filled with performers and a raucous, site-specific concert commenced. Like Tsabar’s Composition, the sound depended on where you were. It was like the party was happening inside the musical instrument.